Masterflame 8000 Series Grill Parts for Charbroil Grills from Grill Parts Distributors, the Gas Grill Parts Specialist for Gas Grills. 8000 Masterflame Burners - Two Different Burners in Two Different Eras. Charbroil has used two different burners in their 8000 series grills. The difference is very hard to distinguish by sight. In 8000 series grills made before 1999, the burner part number is 4594652 and the distance between the venturi tube centers is 3 inches AND the collector box is triangular-shaped. In 8000 series grills made in 1999 and later, the distance between the venturi tube centers is 2 3/8 inches AND the collector box is square shaped. All the other parts we sell for the two grill series are exactly the same. 4594652 Sorry, we do not stock and sell this Charbroil burner. We have no substitutes to offer. in-stock Old, hard to find Charbroil rock grates. Very rusty. Do no ORDER if you will not be happy. 4501758 The triangular-shaped collector box that is part number 4501758 has been discontinued by Charbroil. We are sold out. We have no alternatives for this collector box. The electrode and wire part (part number 5156105) that is used with the collector box is still available separately. It can be ordered through our parts database look up. 4501543 Sorry, we can no longer supply. Charbroil now offers a rock grate for their 8000 Masterflame Series grills that goes ABOVE the burner. This rock grate can replace the flame spreader, vapor bar, or the rock grate under the Masterflame burner. You must put ceramic briquettes on the rock grate ABOVE the burner. We offer the rock grate and the briquettes below. For 8000 series grills, you have a choice of either a porcelain coated wire cook grid or uncoated cast iron cook grids. See below. 4152741 Sorry, we do not stock or sell this cook grid. 4152774 We are sold out of the 4152774 cook grid set. Charbroil has notified us that they are sold out and do not have any coming at this time. If they do re-supply us, we do not expect them until January 1, 2011. We think it is highly probable that this grid will be discontinued and not available again. We now stock the replacement porcelain coated wire cook grid - part number 4152741. It is available for ordering through our part number database lookup. Uncoated Cast Iron Cook Grid Set for the Charbroil 8000 Series - One large -14 3/4 by 14 3/4 and one small - 14 3/4 by 11 3/4. Per Charbroil, if you have purchased the rock grate and briquettes above, you no longer need to use the flame spreader or vapor bar in your Charbroil grill. Depending on the model year, Masterflame Series grills used either a vapor bar or flame spreader positioned above the burner. Please choose one that follows your grill's original design. 8000 Series Charbroil Grills take two warming racks. Carefully read the description of the two warming racks below and their position in the grill head so you can correctly choose the one (or both) that you wish to order. 4152125 Sorry, we are sold out and cannot supply. We have discontinued stocking and selling this part. Main (Bottom) Warming Rack for Charbroil 8000 series. The main warming rack that hooks into the top and bottom casting of the grill. 4156449 Sorry, we are sold out til July 19 and cannot supply. Please check back to order. Special While Quantities Last. Top (Smaller) Warming Rack for Charbroil 8000 series. This is the warming rack that hooks into the top lid of the grill and also hooks into the warming rack below it. It swings as the grill lid opens and closes. It cannot be used without the Larger (Bottom) Warming Rack. 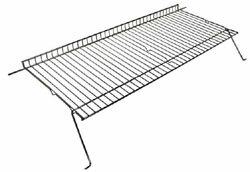 This is the TOP rack (sold individually) for a two warming rack set.